If you’re drawn to the youthful styling, fun-to-drive nature, and hatchback versatility of the Volkswagen Golf — but want something with a little more kick, then check out the high-performance 2019 Volkswagen Golf GTI. With its robust engine, advanced performance technologies, and a wealth of premium features, the Golf GTI will provide you with endless hours of driving enjoyment. Are you ready for a phenomenal driving experience? Under the hood of the 2019 VW Golf GTI is the 2.0-liter TSI turbocharged and direct-injection engine, which doles out an impressive 228 horsepower and 258 lb-ft of torque. Transmission choices include the six-speed manual and seven-speed DSG automatic, which has a Tiptronic system with paddle shifters for manual shifting capabilities. Even with the emphasis on performance, the Golf GTI is still quite efficient, with an estimated highway fuel economy of 32 mpg. 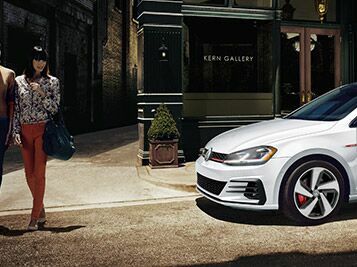 Drivers of the Golf GTI can personalize their driving experience with the Driving Mode Selection feature. It has several adjustable modes, including Normal, Sport, Individual, and Comfort. Individual enables you to adjust the steering and throttle, while Comfort provides a smoother ride. With the Sport mode, the performance of the GTI is enhanced with more aggressive shifts and an enhanced steering and throttle response. 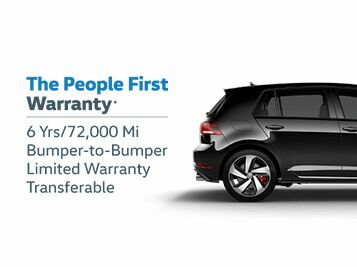 The Golf GTI has the backing of very generous warranty coverage with the People First Warranty, which is a 6-years/72,000-miles bumper-to-bumper Limited Warranty. Also, the People First Warranty can be transferred to another owner in the event that you sell the vehicle. You’d be hard-pressured to find another automotive brand that can match this level of reassurance for warranty coverage. Volkswagen infused the Golf GTI with a high level of safety, especially with its multitude of its advanced driving assistance technologies. This includes the Lane Keeping System, Adaptive Cruise Control, High Beam Control, Parking Steering Assistant, Park Distance Control, Blind Spot Monitor with Rear Traffic Alert, and Forward Collision Warning and Autonomous Emergency Braking with Pedestrian Monitoring.